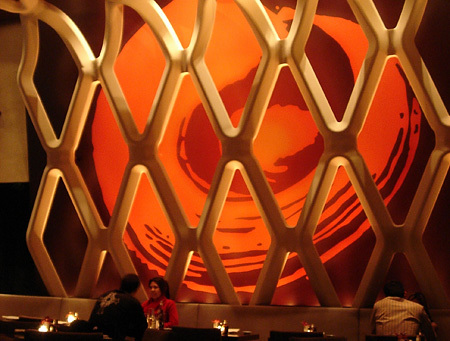 The dining room has that typical dark, trendy look, with booths on the sides and tables in the middle. It's almost cookie cutter, this look. The main distinguishing feature is a giant white lattice that goes from the back wall of the room then along the ceiling towards the front. 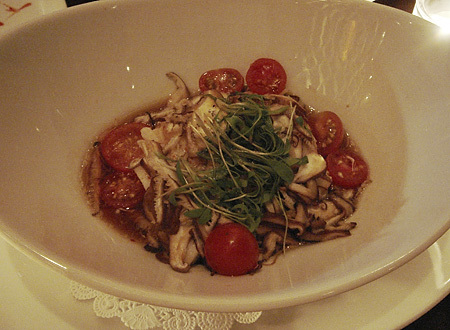 The menu is of a good length, being divided into a few categories with a manageable number of choices each. They highlight their cold dishes and maki rolls by labeling them their "signatures". These are the most shamlessly Nobu-style items on the menu. They even have this dish, Hamachi Fusion ($22), which is basically identical to the Nobu version. 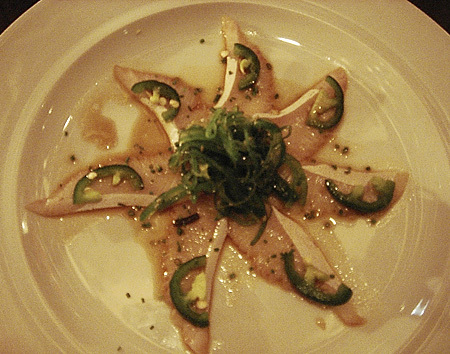 Yellowtail sashimi slices topped with jalapeño slices and drizzled with soy citrus with truffle essence. This was fine, but Nobu's is much better. Koi's jalapeño slices were way too big and way too spicy and the yellowtail slices way too thin. But if I had never tasted the superior Nobu one, I would probably think this was good enough. 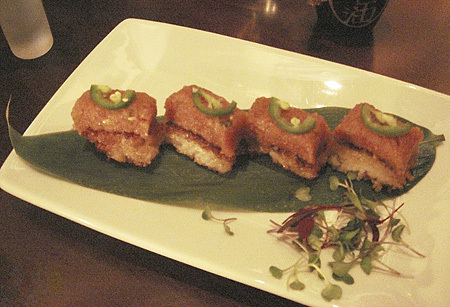 Crispy Rice Topped with Spicy Tuna ($15) was flavorful and the textures of the tuna and crispy rice contrasted nicely. I've had similar dishes to this before but the crispy rice underneath the tuna are usually too bland and dry. Not this one. Four slices of Spicy Seared Albacore ($15) are hidden underneath that pile of crispy red onions. The combination is wonderful. 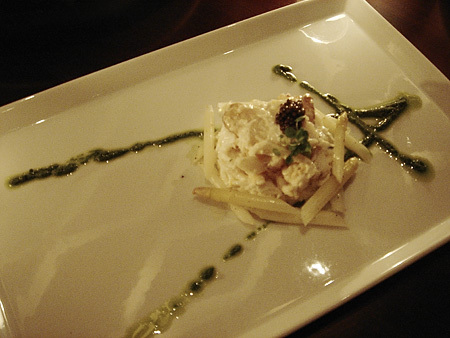 White Asparagus ($22) came with a mound of dungeness crab topped with osetra caviar and a watercress pesto displayed as an "A". The crab was great, but if I were an Iron Chef judge, this is where I would say that the crab took over the dish, overshadowing the main ingredient, the asparagus. But since I'm not, it doesn't matter what was more powerful as long as it tasted good and this did. 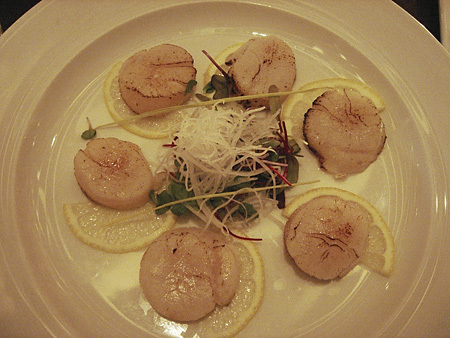 Jumbo Scallop Tataki ($18) sat on lemon slices and were competently executed but nothing special. 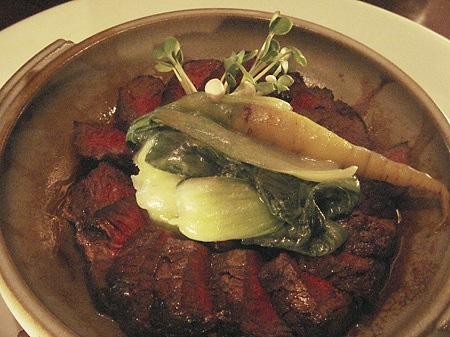 For the hot dishes, we started with the Kobe Filet Mignon Toban-Yaki ($44). It came pre-sliced and with a mound of glazed eggplant and bok choy in the center (plus one white carrot on top). The beef, cooked to medium rare as requested, was tender and juicy and the glazed eggplant and bok choy were good complements to the steak. 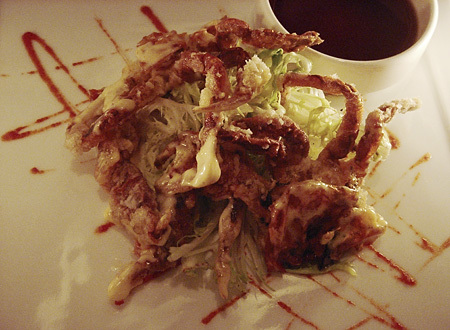 Soft Shell Crab ($14) with spicy cream and ponzu sauce was pretty typical, no better or worse than any other soft shell crab you could get at any of the other Japanese restaurants in the city. It was one of the cheapest items on the whole menu, but it was also a tiny little portion. These days, it seems like every Japanese restaurant has a version of Nobu's famous miso black cod. Koi is no exception. But I'm so sick of that dish (plus I have yet to come across one that is even half as good as the original) that we opted for the Chilean Sea Bass ($27) instead. The filet, steamed with ginger and shitake mushrooms, was tender and flavorful. 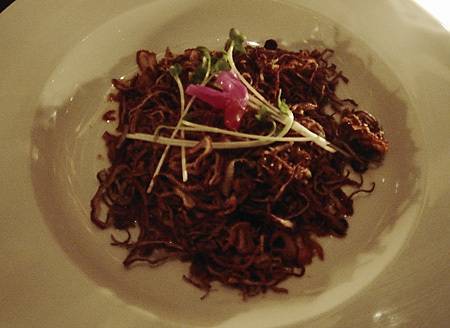 A quite good version of this dish. We had a little sushi at the end to top off the meal. The á la carte sushi is extremely expensive here. You're looking at $88 worth of sushi right here. That's right, $88 for that. The unis were $9 each. And the hamachis $8. Damn. They were very good sushi (surprisingly good, actually, since I came in feeling iffy about the place), but way overpriced. Finally, we tried one of their "Signature Rolls": the BSC (Baked Scallop on California Roll). And it's exactly that. There's a cut-up California roll underneath all that baked scallop you see in the picture. The baked scallop was made with mayo and if you like that kind of taste, this roll would probably do it for you. 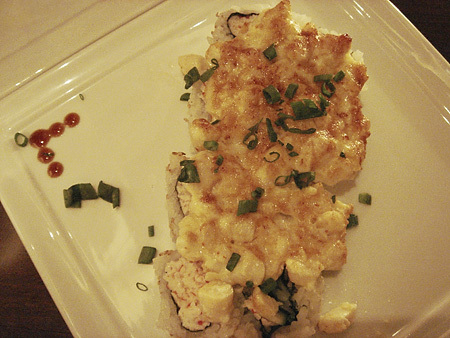 It certainly transforms the otherwise usually bland California roll into something worth eating. Though I think we probably should have gone for the SSC—the Sauteed Shrimp on California Roll—instead since we already had scallop earlier in the meal (and I don't even like scallops that much). Dinner for 4 for the above, with one beer and one cocktail (half of us didn't want to drink on a school night), came out to $360, after tax and tip. 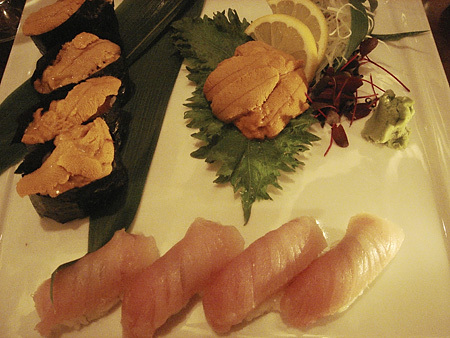 If you want Japanese-fusion, this is a solid choice, but only if you can't score a table at Nobu.